Thanksgiving is a time to celebrate and share with those we love, and that includes your cat! 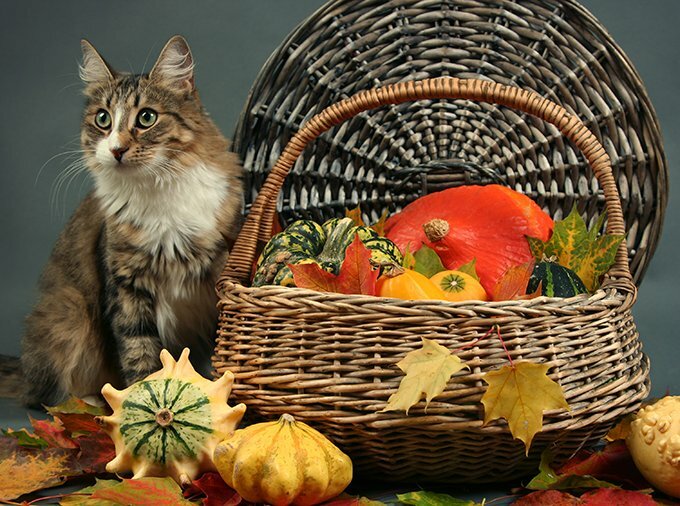 Many cat owners would feel something amiss if they didn’t enjoy their Thanksgiving with their cats by their sides. Wondering if you can share any of that delicious turkey with your kitty? 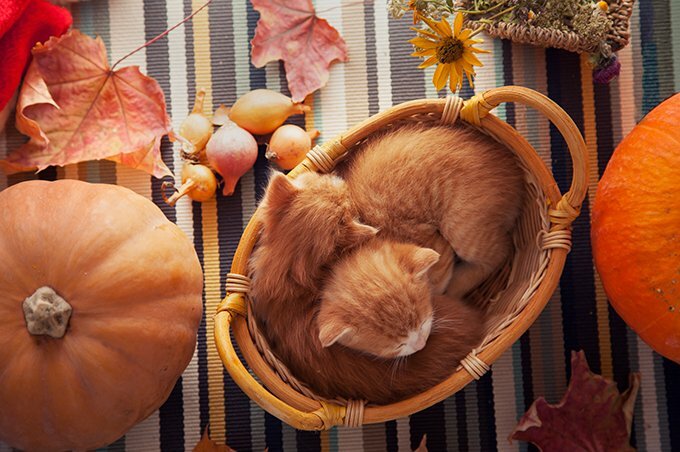 Learn what foods are safe to share with your cat on Thanksgiving, and which ones you should avoid at all costs. It is important to note that, while these foods are technically safe for your cat to eat, you do not want to disrupt your cat’s normal eating habits too much. Foods that are incredibly rich may leave your cat’s stomach feeling queasy and can lead to vomiting or diarrhea. Also, any cat can have an intolerance to any type of food, so be sure to check with your vet before you begin freely feeding your cat from the Thanksgiving table. Turkey is okay for a cat to consume in small quantities. Cats are, after all, carnivores, and a bit of lean protein is healthy for your cat. A little bit of skin or dark meat is fine, but try to stick to giving your cat a bit of white turkey meat if you want to give them a little treat. If your turkey is heavily dressed with garlic, onions, or shallots, avoiding the turkey is highly recommended. Herbs like garlic can be deadly to cats in large amounts. Also, be sure there are no bones in the turkey you are giving to your cat, as bones can become lodged in their intestinal tract and cause severe discomfort or prove fatal. If there are plain mashed potatoes at your Thanksgiving feast, a tiny bit is okay to give your cat. Again, make sure there are no alliums, such as garlic, onions, scallions, or leeks, used to prepare the potatoes. Other mashed potato additions, such as butter, sour cream, or cheese can cause gastric discomfort and digestive issues, so pass on the potatoes if they contain those items, as well. As long as there isn’t an exorbitant amount of sugar or artificial sweetener used to prepare the cranberry sauce, a little taste of it on your cat’s plate or mixed in with their normal food is a healthy Thanksgiving treat for them. Plain green beans are an excellent, healthy treat for both cats and dogs. Again, make sure there aren’t gobs of butter or alliums used to prepare the green beans, and your cat is good to go. Pumpkin is a sweet treat full of fiber that is good for both cats and dogs to consume. It is important to note, however, that pumpkin pie may not be the best option for your kitty. Many sweets contain either large amounts of sugar, dairy, and artificial sweeteners like xylitol. Xylitol can cause a dangerous drop in blood sugar and should not be consumed by either cats or dogs. Pumpkin, however, is great for digestion. There are certain Thanksgiving food staples that your cat must avoid. These foods can cause some digestive discomfort at best and can lead to fatal conditions at worst. This should be a no-brainer, but do not give your cat any type of alcohol during Thanksgiving celebrations. Cats’ bodies are much smaller than ours, and even a tiny sip that would be considered fine for humans can prove lethal for cats. One teaspoon of grain alcohol is enough to induce alcohol toxicity in cats. If your cat really wants to drink with you, opt for a catnip-infused cat-specific wine instead. As mentioned before, alliums, especially onions, can be deadly for cats. Alliums damage the membrane of your cat’s red blood cells, which can lead to anemia. Consuming too much onion can lead to vomiting, weakness, diarrhea, and high heart rate. Thanksgiving stuffing is often full of alliums, which are incredibly dangerous for your cat. Even if your stuffing is garlic-free, the amount of fat from turkey grease or other rich ingredients can wreck havoc on your cat’s digestive system. It is best to keep your cat away from the stuffing. Gravy is delicious because it is so salty and fatty. If your cat sneaks a tiny lick of gravy, they should be okay, but dousing your cat’s dry food with it isn’t the greatest idea. The amount of salt and fat in gravy could cause problems for kitties that already have heart issues. If you are not sure whether or not a certain Thanksgiving food is safe for your cat to eat, it is always better the err on the side of caution and not give your cat any human food. If you want to treat your cat on Thanksgiving, talk to your vet and see what they recommend to spruce up your cat’s traditional dry or wet food routine for the special holiday. Do you share food with your cat on Thanksgiving? Have you ever had a Thanksgiving emergency due to your cat eating something they shouldn’t? Let us know in the comments section.